PLS (Germany) has launched a version of its UDE debuggers supporting the S32K1 family of automotive MCUs. This includes the debugging of the ISO CAN FD interface. 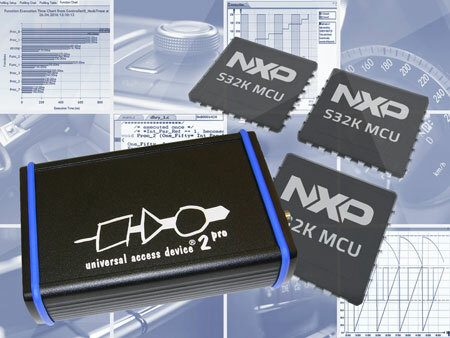 The S32K1micro-controller platform combines a scalable family of ARM Cortex-M MCUs with specific functions optimized for automobile applications. This includes for example, the ISO CAN FD connectivity. There is also the Cryptographic Services Engine compressed (CSEc) implemented. Additionally, the MCUs feature ASIL-B support. By offering support of all internal debug functions of the S32K1 micro-controller platform, the UDE 4.8.3 debugging tool is suitable for troubleshooting and system analysis. The user interface provides besides conventional use of breakpoints and run-mode debugging also a way for visualizing internal system states at runtime. Access to application variables, core, and peripheral registers as well as a graphical presentation of system values in diagrams, allow users to evaluate the runtime behavior of their application. Especially for the S32K14x MCUs with their integrated ARM Coresight trace functions, the debugger offers extensive possibilities for system monitoring and analysis, said the supplier. With the automation interface, based on the Component Object Model (COM) from Microsoft, the tool can be coupled of third party test tools. In addition, this interface also allows users scripting of the debugger without being limited to a specific or even proprietary scripting language.